This is a race report I wrote last year, but never uploaded about my first biathlon. Hope it gets everyone in the mood to race this winter. All it takes to be a nordic racer or biathlete is to show up at a race and just do it! Jan 1st marked a new year, so I figured why not try out a new sport. I have always been fascinated by biathlon and wanted to try it since 6th grade when I gave a report on the subject during the 1980 Winter Olympics. I had even signed up to give biathlon a go at least twice in the last two years, only to have the races cancelled due to lack of snow. As I went to sleep early on New Year’s Eve though, it looked like Jan 1st would be my day. Old Forge confirmed the race was on and fresh snow was already falling. All I had to do was get up early in the morning and make the drive from Lake Placid to Old Forge. I had confirmed by e-mail that I could borrow a rifle (and in a second worried e-mail 10-seconds later, ammo). Registration would be at 8AM, a strange procedure called “zero at 9AM”, a safety clinic for novices (I’ll take two please) at 9:30 and race at 10AM. I pulled into McCauley Mountain at 8:30 and immediately saw the biathlon check in table behind a pick-up truck in the parking lot. A cheerful group of people were signing in. I introduced myself and I think mentioned about a dozen times I had no idea what I was doing other than there was a general concept of skiing and shooting involved. No problem they said and happily showed me the forms to sign-up. I had the option of paying for a $5 one-day race license of going ahead and joining USBA for the year for $75. I figured I would go ahead and jump in so I signed up for the year. The race fee itself I think was $15. Lesson #1: Triathlon vs Biathlon: You show up to a biathlon where folks will provide you with a $3000 rifle to use, ammo and charge almost nothing and you can walk-up and sign-up. You show up to an Ironman and there are huge lines, scowling faces demanding to see your USAT card and drivers license, and you’ve paid handsomely for the right to wait in the line. You most definitely can’t walk up and sign up.After sign-up, I was waved up to the range where I was loaned an Izhmash 7-4 biathlon rifle for the race. They asked me if I wanted to use a sling and cuff, devices that biathletes use to steady the rifle in the prone position, but I told them that I had never used those before so they probably wouldn’t be any help. Even though I wouldn’t be skiing with the rifle, they did have a cover and harness for this rifle so they encouraged me to ski around for a bit with it on my back to see what it was like. I reloaded two clips and he had me fire ten shots at the first target on lane 6 (hence the original assignment of alpha). Thankfully, I was managing to hit the target though a little high. He adjusted me down one click and right one click and had me do it again on “beta” second target over. He pronounced, “that should work for you.” and I was good to go.Lesson #2: Triathlon vs Biathlon. Biathlon is composed of two sports, skiing and shooting. You can show up to a biathlon and have absolutely no idea how to do one of the sports (as long as that sport is the shooting one) and folks will cheerfully help you. If you show up to do that at a triathlon you will drown.At 9:30AM, they had a mandatory safety meeting for the novices. This was a double opportunity for me to learn some rifle safety as well as judge my competition for the day in the novice class. There would be two of us racing novice that day. I quickly learned my competition was named, “Tor”, he spoke with a suspiciously Scandinavian accent, and while I may have dreamt this part I think he took the rifle apart and reassembled it in front of me. I did not anticipate winning the novice class from this point. I did learn though about the “open bolt” rule. Simply put for a novice you must leave the rifle bolt open when the gun is in the rack and you only close it when you are on the line and ready to fire. This is different from athletes skiing with the gun who must ski with the bolt closed to keep snow out. We also learned how to approach the range, get up and down safely (we would be shooting both stages prone), and how penalty laps work. For each miss there was a 150m penalty loop you had to ski around extra. The race would be 3×2.5K. After the first and second 2.5K loop we would shoot five shots prone and then hammer home the last 2.5K.Triathlon vs Biathlon: In triathlon when you get a penalty, you get to take a rest and sit down. In biathlon, a penalty means you have to go farther. The start would be at 1-minute intervals. I would be 5th in line. I ran through the mental check list as I watched the first four competitors go, “bolt open on the rack, ski fast and smooth, don’t ski over the mat and onto the range uncontrollably screaming “cease fire” at the top of my lungs.” Okay, mostly worried about that last one.Five, four, three, two, one and I was off. It really was a beautiful day to ski race. The snow was perfect and the sun was out. A crisp, cold winter day. The course was rolling, but not too tough. Mostly able to V2 all of it except a few quick climbs. I think I came around the first loop in somewhere between 9-10 minutes and then did the quick loop up the small hill to the range. I pulled up to the rack, grabbed my gun, tossed down my poles, and crouched down to the prone position. Thankfully no skiing onto the range. I lined up the first target, held my breath, and squeezed. The black circle flipped to white. Hit. Visions of glory danced through my head. Tor (who started two minutes ahead) got up next to me and sped off. I pulled back the bolt and it immediately jammed. I looked up for help and immediately got it. The range official came in to help me manually load and once another round was ready to go, I lined up and fired. This time the black stayed black. Another jam. He popped out that clip and slipped in a new one. I got off 3 more shots. All misses. I popped back up and made sure the bolt was open and placed the gun on the rack. Grabbed my poles and headed for four tours of the penalty loop. Tor shot the best of anyone that day and I wouldn’t see him again until the finish. Everyone else ahead of me was logging some penalty loops though so I wasn’t alone. The four spins went quickly and I zipped back out for lap number two. My HR was up over 160 which is where I would race a running 10K so I was working. The V2 definitely had less snap on lap two, but I got around okay. Shooting station #2 started with the gun jamming again. Again, lots of help clearing it. I missed the first two, but finally clued in that those little flags set up in the range were blowing pretty hard from side to side. I decided to try “shading” the target and moved my center of aim more toward the edge of the target. Hit, Hit. Awesome! Miss. Well, not too bad. Three penalty loops awaited and I did my hamster impersonation.Last loop was marred by my usual fatigue induced crash with about 1K to go. I get lazy on my step turns as my legs turn to lead. It was just a quick touch and go affair though with no injury done. I could see how a gun on my back might have hurt though. I spun around the last 1K and up the hill to the finish. Final time was 47:00. Later when I looked at my Garmin trace, I found it took me 3:00 to navigate the first shooting station and 4:00 the second. The jams certainly didn’t help, but most of it was me lining things up forever. In comparison world cup athletes can be in and out in less than :20seconds. Triathlon vs Biathlon: Wasted time in T1 and T2 in triathlon can really add time to your race. Wasted time shooting in biathlon can really add time to your race. Snow came, but not enough. Still not enough to open Bristol or use more than rock skis at Mendon or Harriet Hollister. We’re going to postpone the Jan 20th race until Feb 24th. Tentative location will be Mendon Ponds. We still hope to host a race this weekend. Mendon Ponds and Harriet Hollister are a bust, but Bristol Mountain is hoping to be able to make enough snow to re-open its Nordic loop. If they are successful, they are willing to let us host our race there. To help them out and so as not to disrupt other skiers, we’ll shorten the race to 5K and likely use a mass start. Race time is pending right now. Plan would be for Bill Koch race and adult “Try-It” group to follow and race 2K. 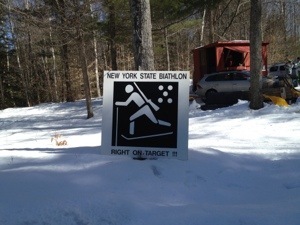 We’ll post updates to NYSSRA Nordic Blog, http://www.rxcsfracing.com, and Twitter (@rxcsfracing). We are currently assessing our options for the RXCSF Mendon Winterfest race scheduled for Jan 20. We have secured Feb 24th as a back up date to hold a race at Mendon Ponds from Monroe County. 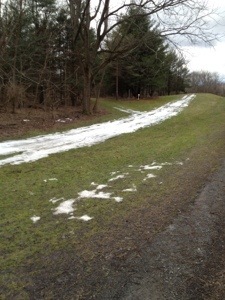 It’s unlikely we will have enough snow at Mendon to race next Sunday. Early this week, after the warm-up has passed, we’ll assess the feasibility of holding a race at an alternate venue such as Harriet Hollister or Bristol Mountain on Jan 20th. Check the NYSSRA Nordic Blog or this site for updates.